A handheld instrument for active tremor compensation during microsurgery incorporates a proof-of-concept hexapod system developed in collaboration with New Scale Technologies. 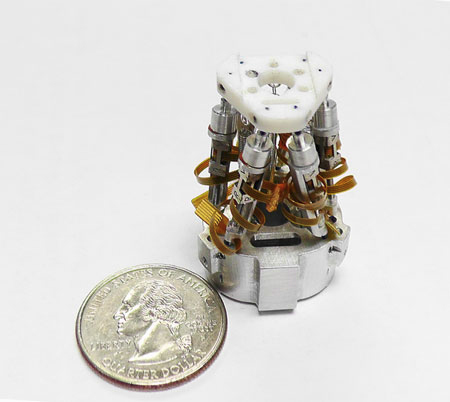 The hexapod system uses six piezoelectric SQUIGGLE micro motors, integrated with miniature bearing assemblies, motor mounts, flexures and spring preloads. Drive electronics, integrated into the miniature handheld instrument, dynamically adjust drive parameters to optimize performance of each motor under varying conditions including changing temperature and side loads. Micro hexapod with SQUIGGLE motor motion system. 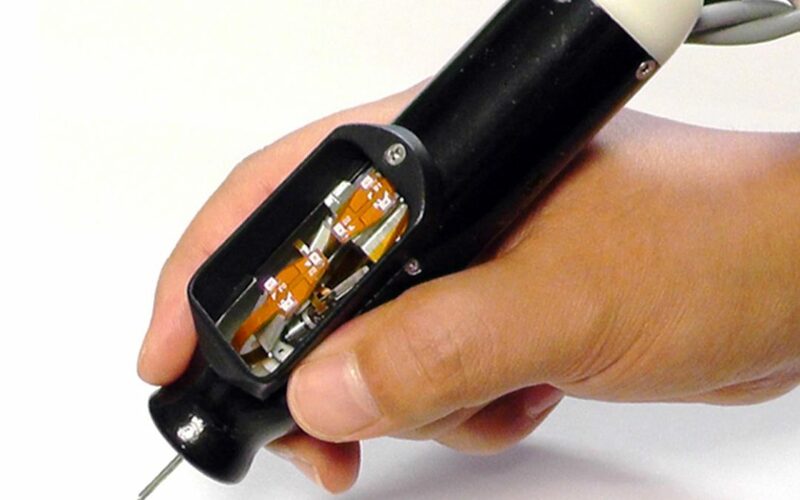 The handheld manipulator senses its own motion, selectively filters out erroneous motion such as hand tremor, and produces stabilized motion at the tool tip via active error compensation. The ergonomic tool is 23 mm in diameter and tolerates a side load up to 0.25 N while tracking a sinusoidal target trajectory with less than 20-μm error. Physiological hand tremor is reduced by about 90% in a pointing task, and error less than 25 μm is achieved in handheld circle tracing. Compared to tele-operated robotic surgical tools, the handheld micromanipulator retains the surgeon’s direct manual control of gross positioning and preserves the natural feel of manual operation. Research reported in this publication was supported by the National Eye Institute of the National Institutes of Health under Award #R43EY026304. The content is solely the responsibility of the authors and does not necessarily represent the official views of the National Institutes of Health. Get the paper from IEEE or contact New Scale for more information about precision micro motion system development and integration.